Be An "Ironman for a Day"! Experience Life As An Ironman On Campus! The ‘Ironman for a Day’ program is the best way for students to come and experience the Bosco Brotherhood. It is a day to walk the halls as an Ironman, engage with students and staff, and see what opportunities are available for you to explore. With the ‘Ironman for a Day’ program, prospective students are given the opportunity to shadow a current student throughout the course of a typical day; this includes going to classes, interacting with students and teachers, and having lunch. All interested prospective students should schedule a visit by clicking on the box below. There are a limited number of students scheduled per day, so please schedule your visit early. The prospective student will be dropped off by 9:00 am in front of DeSales Hall and will proceed inside to the Main Office. There, the student will be greeted by the Director of Admissions, who will give the student a brief overview of Don Bosco Prep and introduce him to his student ambassador. An ambassador might be someone you already know and therefore can request on the registration form. If you do not know anyone you would like to shadow with, not to worry! We will match you up with a current student based on your interests or what area you are from. Beginning with 3rd period, the prospective student will shadow his student ambassador following a set schedule. This schedule will include 3 class periods and lunch, which will be provided to the prospective student at no charge. Following 5th period, there will be a ‘wrap-up’ presentation by the Director of Admissions as well as other administrators, who will answer any questions the student or their family may have. Parents should arrive at 12:45 to pick up their son(s) and report to the Main Office in DeSales Hall. At that time, they will meet-up with their son(s) and have the opportunity to ask any questions during the ‘wrap-up’ presentation. The day will conclude at 1:15. Prospective students are expected to be appropriately dressed when they come to visit Don Bosco Prep. Dress pants or non-cargo khakis are acceptable attire along with a solid-colored polo shirt or collared dress shirt. Depending on the weather, a jacket or sweater may also be worn. Prospective students who attend Catholic middle schools may wear their uniform on the day of their visit. Come to an Open House in the fall or spring and see what sets us apart! CLICK HERE FOR OPEN HOUSE REGISTRATION! Attending an Open House at Don Bosco Prep as a family is a fantastic way to learn more about the school and the Ironmen community and Spirit. The Open House will allow families to tour our 36-acre campus, engage with faculty and staff, as well as meet current students. The goal is to present all of what Don Bosco Prep has to offer and how your son can achieve greatness and success as an Ironman! The Open House will begin in DeSales Hall in our 800-seat auditorium with a presentation about the academic curriculum, student support, and extracurricular opportunities. There will also be an explanation of the admission process. After the opening presentation, there will be small group tours available led by current Ironmen. At the completion of the tour, families are encouraged to meet our Heads of Academic Departments who can answer any curriculum based questions. Also, our athletic staff will be available for you to meet and learn more about our prestigious sport's programs. 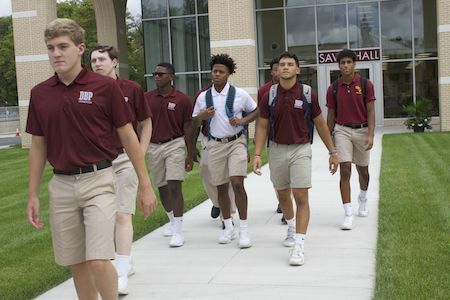 We are excited about hosting you at our Open Houses and show the commitment that Don Bosco Prep has in continuing St John Bosco’s mission of helping young men become “Honorable Citizens and Good Christians”. Savio Hall - Newly constructed in 2017, Savio Hall showcases a state-of-the-art Business Pathway board room, Engineering Pathway/Robotics lab, and Dining Hall. St. John’s Hall - which also houses the Advancement/Alumni Office, newly upgraded Media Center, Information Technology, Art Room, Visual Arts. and Writing and Math Labs. DeSales Hall - home of our Science Department and laboratories, Administrative Offices, Guidance Offices, and Career Center. Immaculata Hall - housing our Campus Store, Gymnasium, and Athletic Training facility. Thomas Kennedy Memorial Park - Memorialized alumni who served and died in the US Armed Forces. Founders Square - Beautiful quadrangle located in front of Savio Hall at the center of campus. Kelly Family Wellness Center- Located in Immaculata Hall and dedicated by Cardinal Tobin in January 2019, this 5400 square foot facility not only serves as a weight room and physical rehabilitation center for our student-athletes, but allows us to expand our Physical Education curriculum as well as utilize cross-curriculum teaching with other academic disciplines which benefits all students.